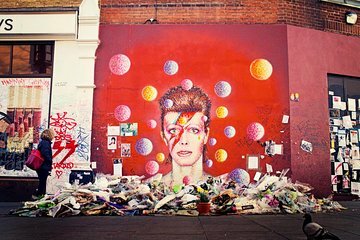 Delve into the cosmopolitan delights of Brixton — birthplace of legendary musician, David Bowie — on a private 4-hour walking tour. Alongside your guide, you’ll immerse yourself in the vibrant atmosphere of the Brixton Market, admire the quaint cafes and restaurants in Brixton Village, and browse fashionable boutiques on Coldharbour Lane. Opt to visit a local art exhibition and learn about the rich history and culture of the area from your personal guide. Relish the freedom to customize your itinerary according to your interests on this private tour of Brixton. After greeting your guide at a quirky café in Brixton, you’ll discuss the day’s itinerary and devise a schedule that incorporates all of your interests. Begin by strolling through Brixton’s Victorian market and absorb the vibrant atmosphere of the area; see vendors selling exotic fruits and vegetables before feasting your senses on the cosmopolitan restaurants and cafes in Brixton Village. As you explore Brixton’s backstreets, you’ll discover the charismatic Brixton community. Marvel at urban art including a vibrant mural of David Bowie and hear of Brixton’s recent radical transformation into a thriving London region. Stop to purchase refreshments in artisan cafes and bars recommended by your guide, whom you’ll inform where you want your tour to conclude. End at one of Brixton’s numerous trendy bars or a central location perfect for further exploration. Excellent tour for my daughter and I. We saw all the David Bowie sites and walked around Brixton. Our tour guide Luca could tell we were done with Brixton and suggested other places. We went to the Camden markets in Camden Town and then walked up Primrose Hill. An excellent day because Luca was such a fantastic guide!